The Five Hymns to Arunachala are the earliest poems of the Maharshi except for a few short verses. They were written around 1914. The Marital Garland of Letters” first and foremost of his hymns to Arunachala, came out in response to the prayers of his sadhu-devotees for some distinctive prayer songs which they could sing on their rounds for alms. Usually, when the Maharshi’s devotees went around singing well-known songs, the householders in the town knew that the food was being eaten by the Maharshi; and they gave large quantities of food, as against a single morsel given to other groups of sadhus. 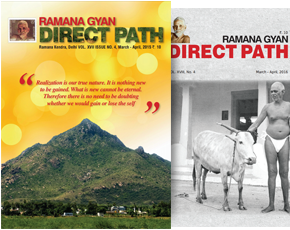 Knowing this, a few unscrupulous men began to pose as the Ramana group and collected the food meant for them. To get over this difficulty, the need for a distinctive prayer-song was felt. 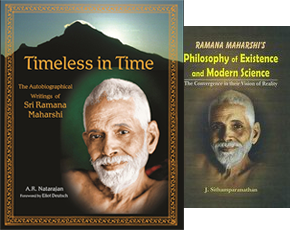 At first, the Maharshi composed a few lines with the refrain “Arunachala” and stopped. His devotees were awaiting for the next lines but nothing more came. One day, the Maharshi went around the Hill alone. That day the rest of the hymn, the “Marital Garland of Letters” (“Akshara Mana Malai”), was composed.The very name of the song, “Marital Garland of Letters”, reveals its import; the bride is the individual soul and the bridegroom is Lord Arunachala. Those who sing or even listen to this hymn are overwhelmed with joy.The Maharshi has once humorously remarked that this hymn has fed us for many years. The “Eleven Stanzas” and the “Eight Stanzas” came next. One day the Tamil words ‘Karunai-yaal Ennai Aanda Nee’ meaning ‘You who claimed me with compassion’ started reverberating in the Maharshi’s Heart frequently. He tried several times to ignore them, but they would not go away. Again and again the words persisted, until at last he gave in and wrote them down. After the first words were written, the stream began to flow, and both the “Eleven Stanzas” and the “Eight Stanzas” came into being. While the “Eleven Stanzas” is an appeal for Divine Grace, the Eight Stanzas explains in full the significance of Arunachala as Absolute Existence-Consciousness-Bliss. The Maharshi explains the genesis of the “Eight Stanzas” in the following way. “The next day I started out to go around the hill. Palaniswami was walking behind me with a pencil and paper. That day before I got back to Virupaksha, I wrote six of the eight verses. The next day Narayana Reddi came. Palaniswami told him about the poems and he said, ‘Give them to me at once and I will go and get them printed.’ He had already published some books. When he insisted on taking the poems I told him he could do so and could publish the first eleven verses as one form of poem. The remaining six verses were in a different metre. To complete the “Eight Stanzas” I at once composed two more stanzas and he took all the nineteen verses with him to get them published. These two poems shine as a divinely inspired commentary on Truth that inspires and instructs seekers. 1. Look, there it stands as if insentient. Mysterious is the way it works, beyond all human understanding. From my unthinking childhood, the immensity of Arunachala had shone in my awareness. But even when I learnt from someone that it was only Tiruvannamalai, I did not realize its meaning. When it stilled my mind and drew me to itself and I came near, I saw that it was stillness absolute. 2. Enquiring within “Who is the seer?” I saw the seer disappearing and That alone which stands for ever. No thought arose to say “I saw”. How then could the thought arise to say “I did not see?” Who has the power to explain all this in words, when even You (as Dakshinamurti) conveyed this of yore in silence only? And in order to reveal by silence, Your state transcendent, now You stand here, a Hill resplendent soaring to the sky. 3. When I approach You thinking You have form, You stand here as a Hill on earth. If one regarding You as formless wants yet to see You, he is like one wandering through the world to have a look at the ether (ubiquitous, invisible). Meditating without thought on Your formless Being, my form (my separate entity) dissolves like a sugar-doll in the sea. And when I realize who I am, what being have I apart from You, O, You who stand as the mighty Aruna Hill? 4. To search for God ignoring You who stand as Being and shine as Awareness is like looking, lamp in hand, for darkness. In order to reveal Yourself atlast as Being and Awareness, You dwell in various forms in all religions. If still there are people who fail to see You whose Being is Awareness, they are no better than the blind who do not know the Sun. O mighty mountain Aruna, peerless Jewel, stand and shine, One without a second, the Self within my Heart. 5. Like the string that holds together the gems, in a necklace, You it is that penetrate and bind all beings and the various religions. If, like a gem that is cut and polished, the separate mind is whetted on the grindstone of the pure, universal Mind, it will acquire the light of your Grace and shine like a ruby whose brightness is not flawed by any other object.When once the light of the Sun has fallen on a sensitive plate, will the plateregister another picture? Apart from you, O Aruna Mountain bright, auspicious does any other thing exist? 6. You alone exist, O Heart, the radiance of Awareness. In You a power mysterious dwells, a power which without You is nothing. From it (this power of manifestation) there proceeds, along with a perceiver, a series of subtle shadowy thoughts which, lit by the reflected light of mind amid the whirl of prarabdha, appear within as a shadowy spectacle of the world and appear without as the world perceived by the five senses as a film is projected through a lens. Whether perceived or unperceived, these (thoughts) are nothing apart from you, O Hill of Grace. 7. Until there is the I thought there can be no other thought. When other thoughts arise, ask “To whom? To me? Where does this ‘I’ arise?” Thus diving inwards, if one traces the source of the mind and reaches the Heart, one becomes the Sovereign Lord of the Universe. There is no more dreaming of such as in and out, right and wrong, birth and death, pleasure and pain, light and darkness, O boundless ocean of Grace and Light, Arunachala dancing the dance of stillness in the dancing Hall of the Heart. 8.The raindrops showered down by the clouds, risen from the sea cannot rest until they reach, despite all hindrance, once again their ocean home. The embodied soul from You proceeding may through various ways self-chosen wander aimless for a while, but cannot rest till it rejoins You, the source. A bird may hover here and there and cannot in mid-heaven stay. It must come back the way it went to find at last on earth alone its resting place. Even so the soul must turn to You O, Aruna Hill, and merge again in You alone, Ocean of bliss.